I resisted seeing the movie as I really just don’t like Matt Damon. I’d heard great things about the novel though and added it to my booklist. I have to say that this is one of the best books that I’ve read in a long time. I usually leave my opinion until the end of my review, but I cannot say enough about this book. You have to read this book! America is exploring Mars. On one of the excursions something very bad happens and the astronauts have to leave the planet. One thing though, they left Mark Watney behind. So how does someone survive on a hostile planet with limited food until help can arrive…taking many months. Oh and the rest of the world thinks he’s dead. We are privy to Watney’s journal as he hopes to leave a legacy about his survival even if he is never rescued. The outlook is dire, but there is hope and action to be taken if he has a chance to survive. This article was published on Mar 25, 2019 . 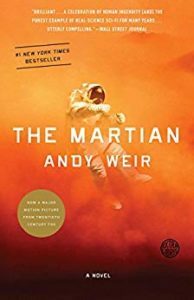 It is tagged andy weir, The Martian, The Martian: A Novel. You can follow any responses to this article through the comment RSS feed.